Back in college my most fashionable friend completely blew my mind by wearing a short dress tucked into pants as a top. Cue to 2015 and it feels like everyone is refashioning something. Just google refashion and get your popcorn ready because its going to be a visual overload! We have so many cute, ignored ties at the thrift store. We also have a lot of cute, ignored skirts. Sadly I only wear pants. This is a popular one on Pinterest and one I may do. I've gained too much weight and 36 year olds don't need tight shorts. Instead of underlaying, overlay it! Or cut up some doilies. 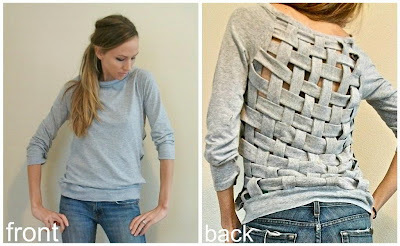 I wouldn't go for this since doily material is scratchy and unravels but to each their own! Wobi Sobi gives very exact instructions on making this shirt. She does a lot of fun redesigns involving scissors and cheap, oversized men's shirts. Can I admit I didn't know you could even buy random studs!? 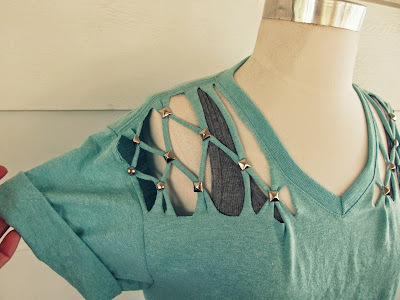 or think of using fabric pens just on a jean's frays! Instead of coloring the fray you could just recover the cuffs. I wonder if scarf material would be too lightweight because I have a lot of pretty scarves sitting around. I love lace SO MUCH! This much lace must have started life as a curtain or skirt right? Actually cute skirts turned into jean inserts? Is anyone doing that yet? I like teeny florals but my t-shirts get a lot of use and would wear out way before the sleeves - although I guess a true refashioner would just fashion them unto something else. oh did I mention I like lace? http://www.trashtocouture.com/ has a lot of cool refashions which don't look insanely difficult. Be warned though - she has a model's build so everything looks great on her anyway. Good for her! I can't figure out how this skirt was made even with the diagram next to it but I still like it! Did they cut the front bottom of the legs off and sew them onthe front top? Where is the extra material in the back come from? Looking at it more closely I don't think these were even the same pair of pants! See the fading? The blue pair is front and center but on the skirt its near the top sides. Also the skirt's fit is much tighter at the hips. That mermaid look is what really makes it adorable and I bet these were originally bell bottoms of some sort. 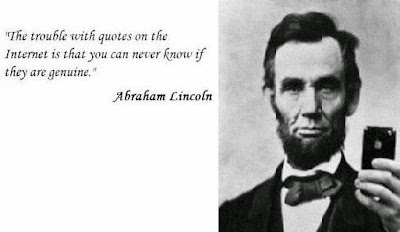 Man, that Abraham Lincoln was spot on! Anyway I bought a tan shirt yesterday planning to make it into...a shirt. I was also planning on donating a shirt with sequins but I decided to keep it and do...something with it too. We'll see if anything of this actually comes to fruition!